My Wild Affair tells the moving stories of animals that formed an unlikely bond with a human. These rare relationships cross the divide between our species and provide a glimpse of the inner life of the creatures who share our world. Each animal’s story is a lesson from the recent past with the power to change our modern view of their species. More than half a century ago, Mike Condy and his three siblings arrived home from school to find a rather unusual pet nestled in the corner of the family cowshed. It was a month-old black rhinoceros, saved during a pioneering wildlife rescue operation on the world’s largest man-made lake - Kariba - in modern-day Zimbabwe. Taken in by the children’s father, wildlife vet Dr John Condy, ‘Rupert’ the rhino was given board and lodgings in the country’s capital for the next six months. The family’s eight-acre property became the little rhino’s territory, and Rupert would doze off each evening in front of the TV, surrounded by his adopted siblings. With the help of his wife, Joan, and his four children, John Condy set about raising the orphaned rhino, feeding Rupert on milk from a bottle. Nothing like it had ever been attempted; in 1960s Africa the species was considered the ‘Devil of the Bush’, not to be messed with under any circumstances. 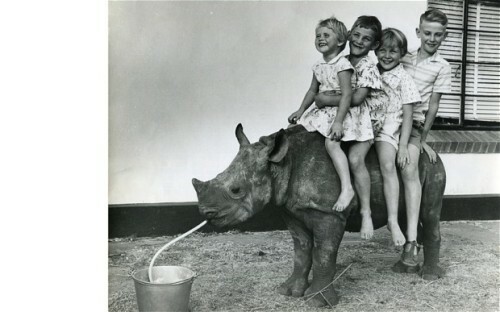 But with careful consideration of the animal’s diet and the provision of a loving home, the family did their best to bring Rupert up a well-rounded rhino with a shot at life in the wild. By the age of 7 months, Rupert had tripled in size and simply had become too big to handle. Released into the bush with another survivor of the rescue operation, he appeared to thrive. But three years later, Rupert’s body was found. The cause of death was unknown, and has never been discovered. Today, the future of black rhinos is at serious risk. With only 5000 left in the wild, each newborn baby is priceless. At Lewa Wildlife Conservancy, a maximum-security rhinoceros reserve in northern Kenya, orphaned rhinos are hand-reared and reintroduced to the wild with impressive results. Visiting the conservancy, Mike discovers Rupert was released too young, and that a hand-raised rhino really needs the safety net of occasional human contact if it is to survive in the wild. He learns of the psychological pain his rhino might have suffered, cut off from his family. Reflecting on the memory of Rupert, and his legacy, Mike comes face-to-face with a black rhino calf for the first time in fifty years. The documentary tells the story of Chantek the orang-utan who lived as a human until the age of nine, as part of a radical language experiment at an American university. He learned sign language and came to describe himself as am “orang-utan person”. He is now in his mid-thirties and lives in Zoo Atlanta. 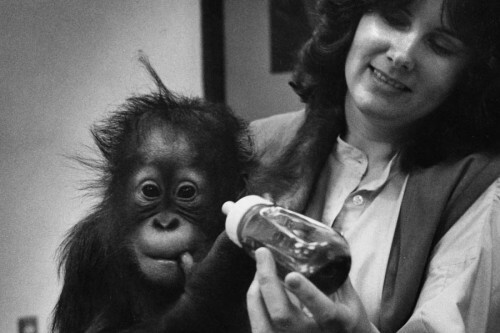 In 1978 Dr. Lyn Miles at the University of Tennessee at Chattanooga became the human ‘foster mother’ to Chantek, a baby orang-utan. In a ground breaking study she raised Chantek as if he were a human, in order to explore the role of our culture in making us who we are. The study asked whether an ape, in a human setting, would become more like a person. Acquiring human language was central to the project and Chantek learned to communicate using ASL (American Sign Language). She chose ot work with an orang-utan as until this point they had been “the forgotten ape” of language research. Miles ensured her unusual foster-son, had all the trappings of middle class life - including toys, TV and birthday parties. Says Miles; “Chantek was like everyone else, just a little hairier. Chantek grew to be very partial to treats such as M&Ms, cheeseburgers and ice cream. He made up his own ‘patois’ terms for items, using the words he knew, such as Tomato Ketchup which he called “tomato toothpaste” . Chantek became a local celebrity making several TV appearances and was a well-known figure on the campus. Ann Southcombe, who had worked with the sign language trained gorilla, Koko, joined the team and worked with Chantek as his primary carer for six years. Chantek showed an affinity for tool use and became a great escape artist who was able to manipulate tools and locks to get out of the enclosure on the campus, despite the best attempts of the university to contain him. “He was outsmarting us at every turn” says the former head of security at UTC, Richard Brown. After one escape too many, and a reported attack on a student, Chantek was returned by the university to the Yerkes Primate Research Facility in Atlanta, where he been born. The separation plunged Lyn into despair and she says that Chantek, whose weight ballooned during his confinement at Yerkes, suffered from depression. On one visit Chantek used sign language to say to Lyn, through the bars of his cage, “Mother Lyn, get the keys, go home”. After 11 years at Yerkes Chantek was rehoused by Zoo Atlanta after the intervention of the zoo director Dr Terry Maple in 1997. Maple is credited with turning round the fortunes of Zoo Atlanta after a series of animal welfare scandals. The zoo now has the largest collection of orangs in North America and Chantek has become integrated into one of its orang-utan groups. Lyn Miles’s language research with Chantek continued periodically. But her relationship with the zoo deteriorated and now her only access to Chantek is as a regular visitor. The zoo does not conduct language research with Chantek, although he is involved with cognitive testing conducted on the entire orang group. What began as a scientific experiment evolved into an emotional bond between a human and an ape who considers himself “an orang-utan person”. This film documents the highs and lows of this unique relationship between Lyn and Chantek, and witnesses a fascinating reunion. Chantek is still the world’s only language-trained orangutan and his ability to communicate through signs offers an incredible insight into the ape mind. In 1974, a baby elephant was rescued from a disused well in Northern Kenya by Samburu tribesmen. 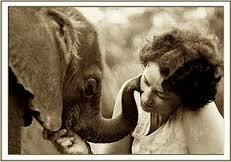 They sent her 500 miles by truck to someone who had a reputation for saving orphaned wild animals – Daphne Sheldrick. Daphne looked after a menagerie of waifs and strays in her back garden but neither Daphne nor anyone else had ever hand reared an elephant as young as this. She was barely a week old and totally milk dependent at a time when there was no known substitute for elephant’s milk. With only cow’s milk to survive on, it was a daily struggle just to keep the baby alive. After a few weeks, Aisha - as she was named - teetered on the brink of death. Having failed in every attempt to find the right formula, Daphne tried a coconut oil base as a last resort. Amazingly, it worked and Aisha began to recover and thrive. Before long she was romping around the garden with the rest of the orphaned animals. Aisha began to look to Daphne as her surrogate mother and, in return, Daphne grew to love Aisha like her child. As the bond between them grew, Daphne didn’t notice Aisha’s affection turn into an obsession. That obsession became a full blown crisis when Daphne had to leave Aisha for 10 days to attend her daughters wedding. Aisha pined to such an extent that she stopped feeding. When Daphne returned, she was severely malnourished and died in Daphne’s arms on Christmas day 1974. Heartbroken, Daphne devoted her life to saving infant elephant orphans using the lessons learnt from mistakes made with Aisha. To date, Daphne and her orphanage have rescued over 150 infants and returned them to the wild, so ultimately Aisha didn’t die in vain. Most wild animals keep humans at a safe distance. But in a few rare cases an animal has made an astonishing connection with a human companion. This story of loyalty, love and devotion bridges the gap between a harbour seal and a man and allows us to glimpse the secret inner life of a wild animal that lives in our midst. Man and mammal worked together, played together, learned together, and, over a 24-year friendship, cemented a bond that hundreds of miles of ocean couldn’t break. “Andre – the Seal who came home” is the true story of a harbour seal who found lifelong friendship with a cranky old guy from Maine. 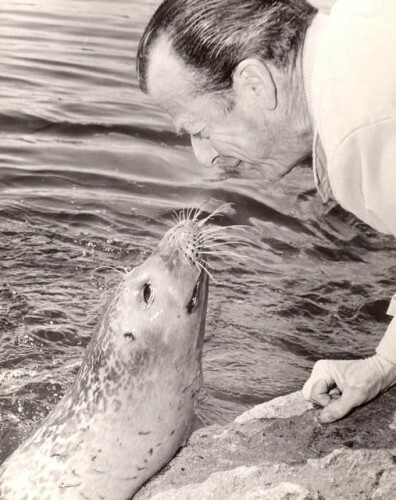 Harry Goodridge, a colourful, sometimes prickly guy from Maine, got in a boat one morning and went out to Robinson Rock to watch the harbour seals that bask and whelp their pups on the rocks there. Once there, he spotted an abandoned 2 day old seal pup swimming alone. The second their eyes met, it was love at first sight. So Harry got out his fishing net and scooped the baby seal into his boat. The eccentric arborist and father of five went diving in his free time and had always wanted to train a seal to become a diving companion. “I think he really wanted a kind of aquatic dog,” recalls Carol Goodridge, one of Harry’s daughters". The documentary tells the story of Andre’s life through a mix of original interviews with the Goodridge sisters, stunning archival footage from the 1960’s, 1970s and 1980s of Andre with the family, and impressionistic, poetic reconstructions of key moments in the life of Andre. We also spend time at the New England Aquarium, learning about the habits of harbor seals, and talking to one of Andre’s old trainers.